An annual award presented by the National Hockey League Broadcasters &rsquo; Association to &ldquo;the NHL coach adjudged to have contributed the most to his team&rsquo;s success.&rdquo; Winner selected by a poll among members of the NHL Broadcasters&rsquo; Association at the end of the regular season. 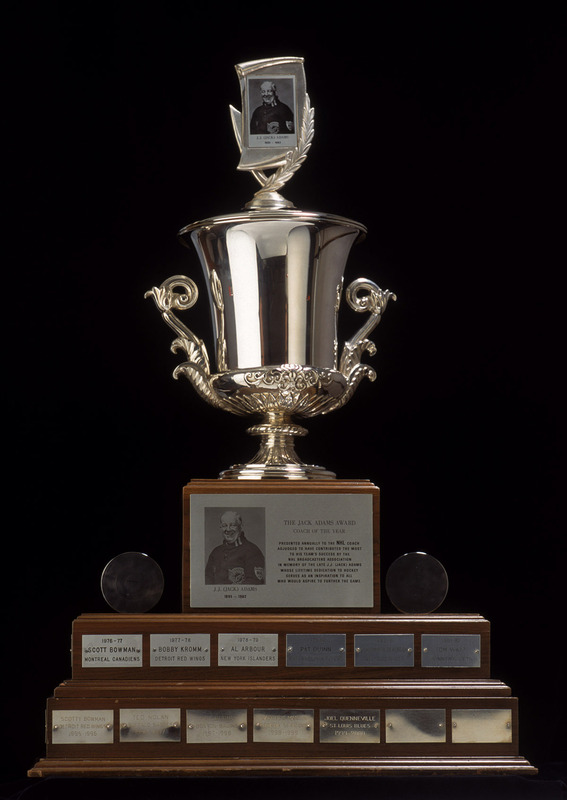 History: The award was presented by the NHL Broadcasters&rsquo; Association in 1974 to commemorate the late Jack Adams, coach and general manager of the Detroit Red Wings, whose lifetime dedication to hockey serves as an inspiration to all who aspire to further the game. Washington Capitals head coach Barry Trotz was the winner of the Jack Adams Award. A runner-up for the trophy with Nashville in 2010, this is Trotz&rsquo; first win. He joins Bryan Murray (1984) and Bruce Boudreau (2008) as Washington coaches who have won the Adams. Trotz was a top-three selection on 80 of the 89 ballots cast, including 58 first-place votes, for 334 voting points. Florida&rsquo;s Gerard Gallant was second with 203 points, including 20 first-place selections. Lindy Ruff of Dallas had just one first-place vote but finished third in balloting with 75 points, ahead of Bruce Boudreau of Anaheim who had three first-place nods, but just 58 points in total. Mike Sullivan of Pittsburgh had two first-place votes and finished fifth with 35 points. Ken Hitchcock of St. Louis also had 35 points, but just one first-place vote. Trotz guided the Capitals (56-18-8, 120 points) to the Presidents&rsquo; Trophy as the NHL&rsquo;s top regular-season club, setting franchise records for total wins and road wins (27). The Capitals were dominant at both ends of the ice, placing second in team offense (3.02 goals per game) and team defense (2.33). They also ranked among the NHL leaders in special teams (fifth on the power play, 21.9 percent, and second in penalty killing, 85.2 percent). Trotz now has 658 career victories over 17 NHL full seasons to rank ninth on the all-time wins list. The Jack Adams Award is named in honour of Jack Adams, Hall of Fame player for Toronto, Vancouver and Ottawa, and long-time coach and general manager of theDetroit Red Wings. It was first awarded at the conclusion of the 1973&ETH;74 regular season.